LEAGUE WINNERS!!!! Our Year 5/6 Boys' Football Team have won the league! Well done! (More details to follow in a blog post soon). It has been wonderful to celebrate with our Year 6 boys' football team, recently crowned champions of the Aylesbury Vale Schools' League. Unbeaten in League matches all year, they clinched the title in a fast and furious final away game against Swanbourne School, displaying skill, sportsmanship and some unbelievable teamwork. The pressure was on from the start but a superb top-corner goal by Freddy H, having weaved his way through several defenders, settled everyone's nerves early on; great clearing by Dennis T kept confidence levels up and Jack W was fearless in his tackles. Accurate crosses from Leo V helped set up goal attempts, heaping pressure on the opposition, while Jasper D - always a safe pair of hands - easily saved Swanbourne's one on-goal attempt. Sam G-H was everywhere on the pitch, defending and attacking, while Olly C's numerous runs culminated in a second goal in the second half, securing Brill's victory. Jack C and Edward D came on to defend the score difference until the final whistle, at which point, boys, coaches and parents erupted in celebration! All in all, it was a much-deserved final game result for an unbeaten League performance. Freddy H was Voted Man of the Match by the opposition, with all the Brill boys commenting on what a sporting and thoroughly nice team Swanbourne were. A last mention must go to Miss Butler, whose support of the team has been unwavering and whose coaching ethos of respect and fair play has ensured they are always a delight to take out. Boys, you have made us incredibly proud - congratulations. Brill's Year 4 hockey players made it all the way to the final, unbeaten, at Waddesdon's Hockey Festival, held at the secondary school on 28th March. Split in two teams, in two different pools, our Pool A team (Ewan M, Jakey O, Harriet B and Lyla V) won 2, lost 1 and drew 1, putting in a hugely creditable performance to finish 4th out of 12 school teams; meanwhile, in Pool B, the Brill team (Georgia A, Rose P, Harry C and Ben N) went even further. Squad member Lyla V writes: "It was a great success. When it came to the results, our Pool A team had made it through to the semi-final but our Pool B team had made it into the final against Ickford - they had won all their matches with their highest score of 7-0 against Whitchurch. The score in the final was 0-0, so the organisers looked at pool points and took away the goals that had been scored against the teams. In the end, Brill finished second." Second and fourth at such a popular festival is a fantastic result that demonstrates the depth of hockey talent in Year 4. Thank you to Miss Webb for her dedicated coaching and well done to the entire squad! On a beautiful March afternoon, two Year 4&5 teams travelled to Ashfold for what proved to be an exciting four quarters of netball. Our players rose to the challenge, demonstrating effective teamwork, good use of space, careful footwork and a determined approach. Squad member Harriet B says, "Ashfold were very good at getting into space and it was a tough game with both sides scoring, one after the other. We tried exceptionally hard and eventually won our match 7-4. Thank you to Mrs Keegan and Mrs Tuffley for helping us." Brill's other team drew 4-4, so well done to the whole squad on a fantastic all-round performance. Our thanks also go to Ashfold School who were hugely welcoming with fair and supportive umpires. They laid on a fantastic match tea after the netball which everyone appreciated. Congratulations to: Nina B (1 goal), Ivy H, Bella M, Annie H (2 goals), Ella C (1 goal), Joe G, Tijmen P, Holly W, Millie A, Damien A, Georgia A, Harriet B, Lilly K (4 goals), Ben N (3 goals), Rose P and Lyla V.
Brill School are number 8 in Webanywhere's top 10 UK School Websites for 2019. When Mrs Ellis sent staff a message releasing the news above, we knew we wanted to share it! Nick Phipps, thank you so much for your design and input (and for all the technical support you've given us in school along the journey so far!). Victoria Timms, your photography is phenomenal; thank you too! Art on the Hill 2019 - Time for us to Share What Growth Mindset Means to Us Through Our Art! The children have had a brilliant time thinking about and exploring how they could represent a Growth Mindset through art. We have such amazingly creative children and staff and our exhibit (down the Year 5&6 corridor) is definitely one to see! Come and visit if you can. You won't be disappointed! Who Did It? Will the Forensic Evidence Prove it? Each class spent some time today working with a scientist, trying to ascertain (from forensic clues) who had committed the crime. The children loved the challenge and the activities today proved to be a real highlight in our week of Science-based learning. Thank you again to Miss Webb for organising such brilliant hands-on workshops. We had many inspired children today; engagement and enthusiasm levels were high! It was impossible to move around school this morning without walking into a room of fully engaged, excited and focused children; the learning 'buzz' was tangible! Lots of hands on scientific experiments meant that today will be a real highlight in this, our Science Week 2019! Thank you to Miss Webb for all the organisation and to the teachers for coming up with such brilliant learning opportunities for the children. What an amazing experience! All the rehearsing and effort to work towards the concert at The Royal Albert Hall last night was definitely worth it. The 900+ strong choir put on an impressive concert that was well-received by our audience. Having spoken this morning to many of the children who were part of the Echoes 2019 choir, it has become very clear they feel proud of what they achieved; and so they should! 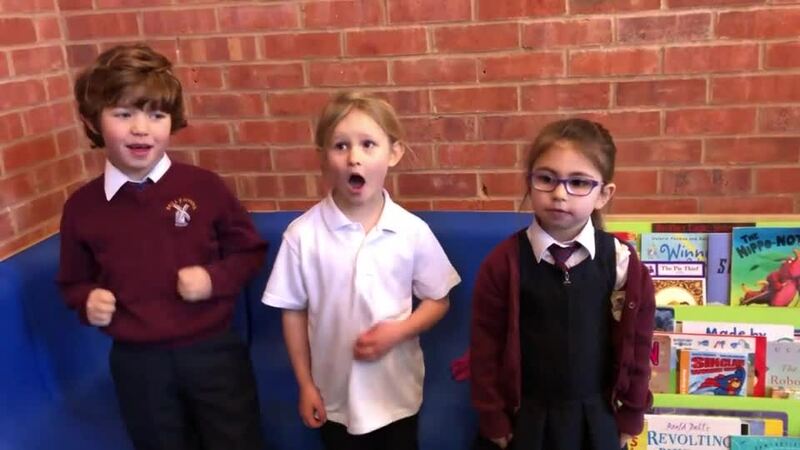 Once Mr Dickson has helped me with some technical aspects of sorting the videos, I will upload them onto an area on our News page so you can share a few clips from some of the songs the children sang. On 7th March, we took our Yr 3/4 hockey team to a tournament at Barley Hill School in Thame - their first competitive outing. Having impressed in training with Miss Webb, it was time to witness their skills in action, however, the team surpassed all expectations by finishing joint winners of the event. Team member Georgia M (Yr 4) gives her account: "The hockey was galvanising and I really enjoyed it. There were four different matches to play, including the final, and we won two, drew two. We ended up joint first and the team we were against, called St Joseph's, got to keep the trophy to start with. I think our collaboration was Brill(iant)!" Well done to all our fantastic players: Harriet B, Harry C, Georgia M, Ben N, Jakey O, Rose P and Lyla V.
Still in its inaugural season, our Yr 5/6 girls' football team is growing in skill and confidence under the watchful eye of coach Mr Dickson. Their first match in the Aylesbury Vale Primary Girls' League, on 5th March, was an away fixture against Thomas Hickman School and some much-improved passing resulted in a few unlucky misses. The final score was 1-1 but Mr Dickson is especially proud of the girls' boundless positivity and "innate determination" to keep going until the final whistle. On 13th March, they got to experience a range of opposition play at the Thame Partnership Girls' Football Competition, held at Tetsworth, playing several matches and drawing each time. Coach and parent all but leapt into each others' arms in celebration when Ellie E-M scored a super goal in one match, saving us from defeat. Although they missed out on a final, the girls' teamwork has come on hugely so watch this space! Well done to: Georgia A, Alice C, Ellie E-M, Francine E, Leah G, Ivy H, Sophia H-C, Ayjah S, Evie T and Holly W.
Our Year 1 Safety Spokespeople Go Live! Brill School in the top 10% of Buckinghamshire schools for progress and attainment! Our school has gone from strength to strength with outstanding results for our 7 and 11 year olds in SATs. Did you know their hard work puts Brill’s results in the top 10% of the 229 Buckinghamshire primary schools for reading, the top 7% for writing and in the top 6% for maths? We’re especially pleased because these percentages are based largely on progress (how much children develop between entering and leaving the school) rather than just the scores they got. We are ambitious for all our pupils and aim to be in the top 10% or higher over the coming years. Yet this isn’t all we are ambitious about. We are not satisfied with only great results in core subjects. We want resilient, creative learners guided by strong values and we want to give them enriching, happy and secure primary school years. We think what makes Brill special is the work we put into developing a curriculum and learning environment that means pupils develop in all these ways, flourishing as individuals, and leaving Brill ‘with the wind in their sails’. Our priorities for the coming school year are rooted in our belief that our pupils will do best when we get this balance right, when we create a caring environment rooted in our Christian values and when we work together as a whole school community. If you would like to see more detail on the school's results, then please read this blog post on how we did last year - or go to the government's Compare Schools website here. Thank you to all the parents who took the time to fill in our survey. We had a great response. Over 70 parents replied and 97% would recommend our school! Your answers indicate that almost all of you are very happy with most of what we do. We are particularly pleased about the overwhelmingly positive response to questions about how happy, safe and well taught you feel your children are. The daily mile - you would like us to keep it going! Last year we made lots of improvements and you liked these. Some of you would like there to be fewer emails. We’re trying to work out how to reduce these and communicate more using the website. Some of you asked for more notice of events, particularly those that involve transporting children and anything with fancy dress! We have already sent you all the fancy dress dates for the year and staff are timetabling other events as early as they can. Some sports fixtures and other events are only organised with short notice but we hope you understand we want the children to be able to take part in as many as possible and do our best to tell you as soon as we know dates. We hope you’ll think the school's results speak for themselves, but we are going further to ensure children make rapid progress in core subjects. Classes will now be doing maths, guided reading, literacy and wizard maths in the mornings and the management team are reviewing every child’s progress in science with their teachers half termly in the same way as we do for maths and literacy. A few parents wanted to be sure their children were being stretched enough. Growth mindset is a big focus this year and will help pupils challenge themselves whatever level they are working at. To hear more, read about our priorities for 2018-2019. Some parents want to understand their child’s progress better. We had very positive feedback about the new format for parents’ evening last year. This year we’ll look at how we explain the way progress is communicated and make sure it’s clear and useful. This is a tricky one. 24% of respondents don’t feel their children get age appropriate homework. What’s difficult is that people disagree on whether it’s too much or too little and on what type of homework would be best! We’re having a think about homework and we plan a parent information evening and some other communications to explain our approach and how best to help children. Look out for a request from your parent council rep to tell us what you most want to know about. We had lots of positive feedback about the number of clubs and extracurricular events on offer. Some of you want to understand more about how children are selected and how we make sure all get a fair chance to be involved. Staff try very hard to help all children take part in activities and keep a record of who attends what. We agree we could be clearer about how and why we select pupils in different ways for different events so children and parents understand. You’ll soon get some information on the principles we use to select or encourage pupils to take part in different sports events. You also asked us to consider more clubs like choir as well as all the sports clubs. We have listened and drama club is starting this term. Maths club is on the way and choir will be back. Can you help with this? Do you have a passion you could share with the children in a lunchtime or after school club? Chess? Gardening? Knitting? Enormous thanks to all of you who took part. If you haven’t seen the issue you raised in this summary, please be reassured we have taken account of all your comments. Keep telling us what you think: your feedback and willingness to come and talk to us straight away with problems helps us get better. You can always talk to staff or to governors. You can also contact your parent council representative or even leave a comment on our news posts! As you’ll see from our results, last year was the latest in improving progress for pupils. Last year we focused on improving guided reading with regular class sessions and homework to prepare for them. With the help of our amazing volunteers, we encouraged even more use of the library. We also developed wizard maths to include number facts for younger years and put in place short, daily sessions in spelling, grammar and punctuation which are fun and engaging. This year writing is a big focus. Teachers will be finding exciting stimuli and contexts for writing to motivate children. There will be lots of work on editing and improving writing so that children understand the process or ‘journey’ and have fun with it. Classes have been involved in naming their books for this: they have ‘Brilliant Brainwaves’ books for drafting and ‘Wicked Work’ books for final drafts. Teachers are also changing the way that literacy is assessed with the larger focus on grammar and handwriting that is now expected in schools. In maths, we will be using more ‘hands-on’ maths equipment to help all children get a deep understanding of number. Have you seen Mr Gore talking to Sky News about this? Maths equipment especially helps children with ‘dyscalculia’ (the number equivalent of dyslexia) but is very important for all maths learners. Did you know that children’s progress is tracked very carefully each half term? All class teachers meet with the leadership team to review where every child is with maths and literacy and what challenge or support they need next. This year we’re going to track progress in science in the same way. Making rapid progress is partly about children having the confidence to challenge themselves. Our pupils understand growth mindset but we need to go further and help all of them rise to a challenge, take risks and see failure as a learning opportunity. We’ll be running an evening for parents about how to help with this - dates coming soon. Last year we started using our highly skilled teaching assistants slightly differently in some classes. We organised their time so they could support all children, including those with additional needs, and to actively help children develop their independent learning skills. This approach has really helped children of all abilities and needs tackle more challenging learning tasks, make rapid progress and feel successful. We have also learned that many strategies for helping children with specific learning needs can help all learners, whether it’s hands-on maths equipment, different coloured backgrounds to help reading, or using different shapes to teach about word types. More and more of these powerful strategies will appear in all our classrooms. We are tracking the impact of our new timetable for specialist support and continuing to improve how we work in partnership with the parents of children with additional needs. We will also be offering some workshops and information evenings for parents who want to know how to support their child at home, whether or not their child has any additional needs. After successful development of the library and the ICT suite, the process of transforming our Year R space has begun this summer. Our new teacher, Gill Salt, has created an imaginative and purposeful outdoor space. Parents and children now come in together at the start of the day through our new entrance and more is to come. Read more on the new Year R blog! We remain keen to tackle our smallest classrooms in Year 3 and 4 and expand the hall next. We’re very constrained by budget as you can imagine but we’re exploring all the options we can. If you'd like to hear more about our plans for 2018-19, please watch the videos of our Parents Update evening from September 2018. You can see Mrs White's introduction here, our chair of Governors Liz Cotgreave here, our Deputy Head Mrs Baker here and our Assistant Head Mr Gore here.